MG Magnettes are well-known for their lack of power ('Tis said that Magnettes don't accelerate, they gather speed) and their deafening noise levels due to an extremely low rear axle ratio. 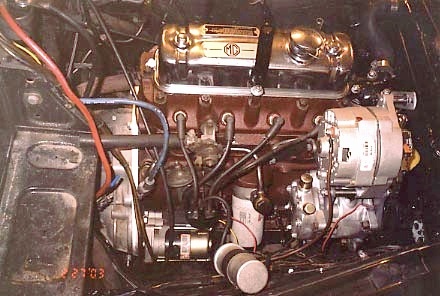 A number of Magnettes have been converted to MGB "B-Series" 1800cc engines with vast improvements in performance. Similarly, vast improvements in drivability have been accomplished by switching rear end ratios from the original 4.55:1 to either 4.3:1 or 3.9:1. If the car is to be driven at sustained freeway speeds, with acceptable noise levels, an overdrive or fifth gear is an essential further improvement. The rear end swaps are very easy and can be accomplished in about two hours. My preference has been for the 3.9 – as found on the "banjo axle" MGBs built prior to 1968. One need only to remember to retain the spider gears from the ZB rear end as the half-shaft splines on the ZB are not compatible with the MGB ones. Considering the ZB's comfortable ride, and excellent handling and braking, I chose to upgrade the car so that its comfort level could hopefully be sustained up to 70-75 mph. 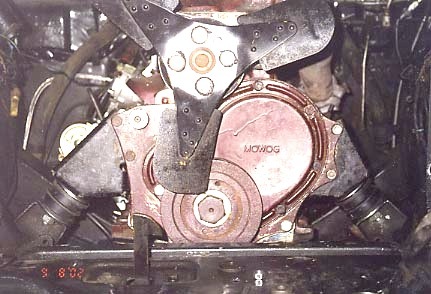 The performance of overdrive- equipped MGBs was our model. We therefore chose a 5-main 1800 MGB engine, together with a Rivergate conversion kit, designed to mate a Datsun 280Z 5-speed transmission specifically to the MGB 5- main engine and, of course, the 3.9 rear end. Three main MGB engines offer the same power and much simpler installation, but the five-main engines are extremely durable, therefore worth the additional problems encountered. Because comfort was our main goal, we also installed seats with more back support, and air conditioning. These topics will be covered in Part Three. Why not an MGB overdrive transmission? Its large size requires substantial alteration to the transmission tunnel. The Nissan box is more compact, sturdy enough to handle the 6-cylinder 2.8-liter Datsun engine, and it is readily found in the US. Some owners have used the MGB overdrive transmission and only they can speak to the problems encountered in doing that conversion. Choices for the five-speed conversion are the Ford Sierra conversion marketed in the US by Butch White, the Nissan 280Z conversion kit made by Novus in California, and the kit I used made by Rivergate Restoration Products in Soddy-Daisy Tennessee. My rationale for choosing the Rivergate kit ran as follows. First, either the Sierra kit was not yet available in the US or I didn't know of it. I had read the account of a Sierra conversion in the UK on the MGCC bulletin board. It rather intimidated me at the time, and I knew nothing of the Sierra box itself. Second, and this is rather fortuitous, Soddy-Daisy is only about a half-day's drive from my home and I could go down there and meet the people who build the kit and view the components firsthand. I did that, and I was so impressed that I chose the kit on the spot. In fairness to others, this is in no way a criticism of the other kits; it is simply my account of my choices and my experiences. Speaking in hindsight, from what I now know about all of the options, the Rivergate appears to be the easiest. I was impressed with the people behind the Rivergate kit. Bill Perry and his son are MG folks –having raced Midgets for a number of years. Their shop is incredibly clean and well organized. Their kit is beautifully executed. I came to regret hiding their backplate between the engine and transmission; I would rather hang it over the fireplace as an objet d'art – right next to the refinished ZB dashboard I received from Lou Shorten. The Perrys were extremely cooperative and anxious to see their kit employed in a Magnette. I felt I couldn't go wrong with that kind of integrity and enthusiasm behind me. Experience has since shown that these feelings were right on the mark. Problem number one is that the well in the Magnette engine oil sump is in the forward part of the sump rather than the rearward part as in the MGB. This is due to the relative locations of the steering crossmembers of the two cars. It runs under the forward part of the engine in the B, but under the rearward part in the Magnette. Therefore, the 1800 engine will have to use an original Magnette oil sump. This is not just one problem. You don't just swap the two sumps. 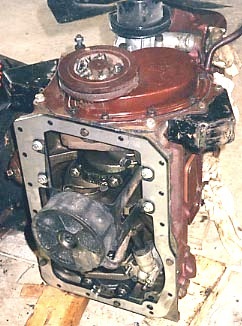 The oil pump feeds from the bottom of the well in both engines, so the Magnette oil pickup and strainer need to be employed also. Furthermore, the dipstick must read the amount of oil in the well, so the rearward dipstick on the MGB 1800s is now useless. It has to be replaced with one under the dynamo that does drop into the Magnette 1500 well. 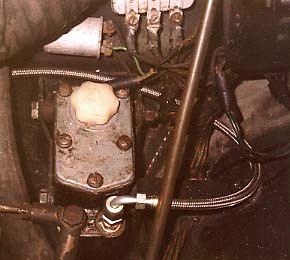 I had been told that the three-main 1800 as found on very early pull-handle MGBs (up through early 1965) yields the simplest solution to this problem, because first, it utilizes the same bolt pattern for the sump, making the sumps interchangeable; second, because the block retains the threaded mounting holes for the Magnette oil pick-up; and third, because the hole for the forward dipstick is already drilled – one needs only to remove the plug. I had a rebuilt 18GB engine on hand. 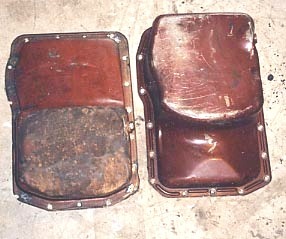 These were used in 1965-67 MGBs. Among the five-main B engines, these would be ideal for use with the Magnette box, by the way, as they provide the five-main durability with the earlier backplate and starter configuration. But they do have the rear main seal in the backplate, so they are compatible with the Rivergate kit. They are also, in "stock" high compression configuration, the most powerful of the five-main engines – at 98 horsepower – a substantial boost from the ZB's original 68 horsepower 1500 engine. Problem number two: the sump bolt pattern is not compatible with that of the must-use ZB sump. Number three: the block is configured such that not only are there no holes to attach the must-use ZB oil pickup, there's no block material in the neighborhood into which to drill the holes! Number four: while a boss is cast into the block where the dipstick should go, it is not drilled, and that is a frightening task. 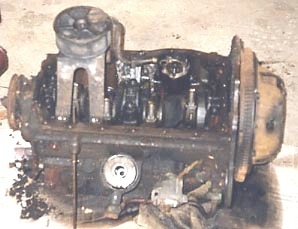 Illustration #2 shows the same engine with the oil pickup removed. The bolt holes are circled in "White Out" so as to make them more visible. Keep in mind that this part of the block surface does not exist in the five–main blocks. But when swapped out, and after the bolt pattern on the ZB sump has been adapted to the 1800 block, one discovers that the 1800 oil pump does not clear the shallow end of the ZB sump. It's close and I figured that with a slightly shorter outboard mounting stud for the pump, it might just clear. But that solution didn't rest comfortably. 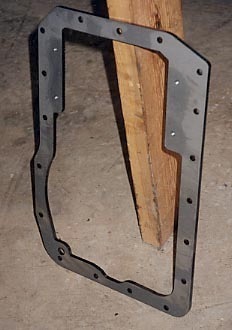 My solution was to design a 1/4" thick steel plate shaped very much like a sump gasket but providing the bolt holes for mounting the oil pickup, while moving the sump down 1/4" so as to comfortably clear the bottom of the oil pump – even with the original outboard stud still in place. This plate is shown in illustration #3. Note the four bolt holes in the inner "ears" of the plate toward the top of the illustration. To allow just a little adjustment room, 1/4" hardware (with flat washers) replaced the original 5/16" hardware for mounting the pickup. 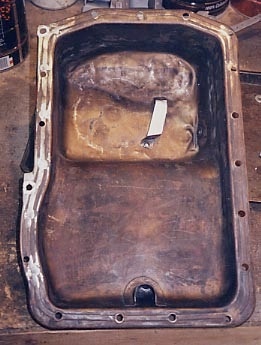 A major concern was whether the plate would allow sufficient clearance between the sump and the crossmember. At this point, the original 1500 engine was still in the car, so I cut scraps of 1/4" and 3/8" plywood and tried to slip them between sump and crossmember, thus determining the original clearance – which appeared to be just slightly on the plus side of 3/8". This is with engine and transmission mounts of unknown age and deterioration. I simply took a chance! In fact, the new arrangement did clear the sump but of course the clearance was tighter. Illustration #4 shows the solution to that concern. Some large fender washers – two inches in diameter - were placed on the front engine mounts. Two of them on each side brought the engine up 1/8" and once again the 3/8" plywood scrap slid between sump and crossmember with a little zone of comfort. In Illustration #5, we see a comparison of the two sumps. The Magnette sump with the well toward the front is shown on the left. The MGB one with the well at the rear is on the right. 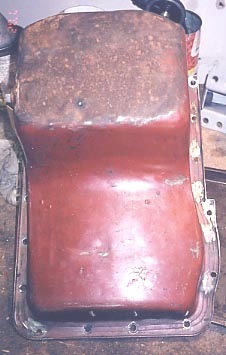 This picture was taken after the new bolt pattern had been drilled in the Magnette sump. 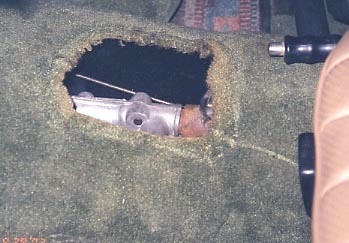 Note that on two locations: the left front corner (as shown) and the forward bolt hole in the oil pump "bay" on the far left of the picture, the edge of the flange had to be trimmed as there is insufficient material to enclose the new hole. But for aesthetics, this is not really a problem, but I did solve it by welding in some little extension pieces on the flange. It is shown in illustration #6. 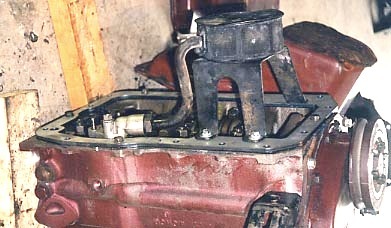 Since the sump is facing the other way here, the "extensions" appear on the right in the illustration. Note the back three holes marked with "White Out" (visible at the bottom of the illustration) are the three original holes in addition to the front center one that line up with both blocks. In Illustrations 7 and 8, we see how the steel plate functions to mount the Magnette oil pick up to the five-main 1800 block. And finally, illustration #9 shows the completed steel plate "sandwich". I used two sump gaskets and clear RTV on both joints. Drilling the hole for the new dipstick location is rather intimidating. Note, by the way, that the dipstick tube does thread into the block. Those two grooves at the top of the tube are there for a purpose: placing a large screwdriver in them allows one to turn the tube out of the hole. It is a 1/8" BPT, which, courtesy of Mike Ash, I learned is "British Pipe Thread" and an American 27 TPI tap is so close that once threaded, the tube will snug several revolutions into the hole before fighting back. It is all too tempting to drill the new hole perpendicular to the face of the boss, but don't do it! I made an adjustable drill guide from a Midget rocker platform on a bracket that I made to bolt into two of the sump bolt holes from the top side. It did hold the drill true. But the trick is to set it correctly in the first place. It is quite critical. If the angle is too shallow, the dipstick will foul the pickup strainer. A little to steep and it will come through the sump mating surface at the bottom. All I can say is I got very lucky. This is one part of the job you might want to entrust to a machine shop. Also, this is best done while the engine is being rebuilt – before bottom end is assembled. That way, one can be sure of keeping metal shards (from the drilling) out of the bearings, etc! As it was, I dealt with an engine that had been previously rebuilt. Needless to say, I masked the area in plastic and duct tape very thoroughly. And I smeared a lot of grease around the area of anticipated drill emergence – to entrap the shards. It is amazing how easily the cast iron can be drilled. I always oil my bits when drilling in metal, but here it was particularly important as the oil also kept shards from flying. Even though I was lucky, it was necessary to extend my dipstick rest platform (in the bottom of the sump well), as my relocated stick did not quite line up with the spot where the factory wanted it. Illustration #10 shows my extended platform. Note the imprint of the pickup strainer on the bottom of the well, and how close it is to the dipstick rest. This illustration also clearly shows my homemade sump flange extensions on the left side of the picture. These are the major engine problems, but there are a few smaller ones that one should be prepared to meet. 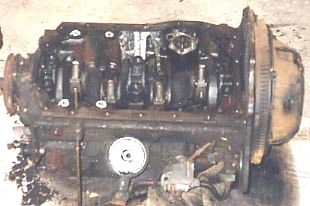 First, the 18GB engines used a longer water pump. I've read somewhere that the five-main engines are actually longer, but I didn't notice any difference except in the length of the water pump "nose". At the time, I was anticipating needing an extra pulley to drive an A/C compressor, so I switched over to a pump designed for an early '70s B with the spare pulley for the smog pump. It turned out I did not need the second pulley, but I did need the shorter length of those pumps so equipped. Yes – two pulleys but shorter pump! In other accounts of this conversion, I have read that in no case will the original 1500 pump serve the 1800 engine – even though it may physically fit. So don't even consider a 1500 water pump. It's also a good idea to use a '70s B plastic radiator fan. Further down the line, there is another small constellation of problems. What kind of exhaust manifold or header? Know right up front that nobody makes a header that will fit the Magnette. If you want one, it will have to be custom built for you. The MGB headers and manifold snag all over the place on left-hand drive Magnette steering gear. Not even close. My solution was to use the original Magnette exhaust manifold. And by the way, the 1800 engine fits all the Magnette ancillaries – manifolds, carbs, intake plenum and air cleaner, generator, distributor, etc. 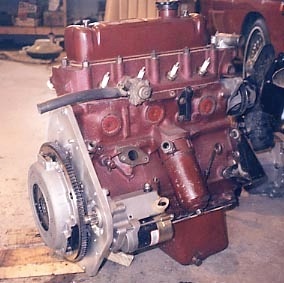 This engine swap can be done so the only way an observer knows you have an MGB engine is by looking at the embossed "1800" on the lower left front of the block. Yes, the engine number would give it away also, but that can be removed or changed. My car, however, had so many obvious modifications, I did not concern myself with deceiving the observer – although I do take some pride in the close resemblance of the engine appearance itself. Back to the exhaust manifold... While I did replace the entire exhaust system with 1-3/4" pipe – for more than one reason as we shall see – the Magnette manifold allows the 1800 to breathe quite well, and of course the finished job looks more original. But... the Magnette exhaust manifold will not clear the MGB front tappet cover. Save the front tappet cover from the 1500 and re-use it. This means using the original Magnette crankcase ventilation. The vent pipe is held in place with a bracket to one of the studs holding the blanking plate over the hole for a mechanical fuel pump. Now this hole/blanking plate/stud configuration disappeared on the 18GB block. It returned later on – when I don't know, but those using 18V blocks will find it just where it was on the 1500. On the 18GB block, I had to make an additional bracket to support the pipe from one of the sump bolts. If placing another MG engine utilizing the same basic block and ancillaries requires almost 3000 words and ten illustrations to describe the problems, what would it be like to put in that Datsun transmission? Here I will speak only for the kit I used. But Rivergate solves just about all the problems for you. The kit utilizes Rivergate's own backplate, their modified five-main flywheel and correct pilot bushing, with a late-model MGB starter and clutch cover with a Datsun clutch disc. You use a cold chisel to knock off the piece on the rear on the rear of the cover intended for the carbon throw-out bearing, because it uses the Datsun roller- style throw-out bearing (and slave cylinder). Since the kit is designed to work with the late model MGB starter, I took this opportunity to go a step further and use one of the new smaller gear reduction starters. 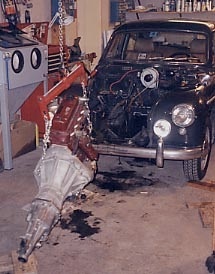 Everything goes together just as easily as assembling an MGB engine to an original transmission. Illustration #11 shows all components installed – ready to accept the transmission. The new starter did create a bit of a problem as it snagged the steering crossmember, but I discovered these starters could be adjusted rotationally to three different positions and one of them worked perfectly. Illustration #12 shows the completed assembly, with the gear lever attached just for amusement! We were now ready to see if this will actually fit in a Magnette! Well, indeed it does fit very well. There are some small problems. 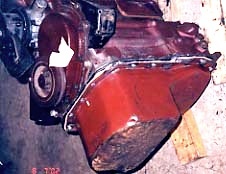 The top rib of the Datsun transmission comes excruciatingly close to the top of the opening of the transmission tunnel at the bulkhead. One solution is to file away a bit of that rib, but the actual clearance problem is not the top of the tunnel itself, rather just the overhang of the bulkhead material into the tunnel opening. I confess I fixed that with a crowbar – bending the overhanging bulkhead material back into the tunnel. The other problem concerns the distance from the bell-housing front to the shift lever. 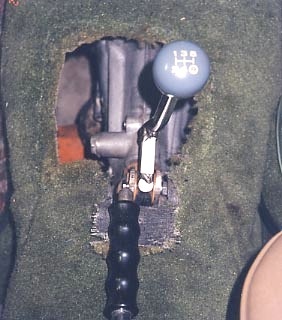 It is perfect for replacing a 4-syncro late MGB transmission, but in any MG originally outfitted with the earlier 3-syncro box, the Datsun gear lever is going to come up about three inches further back. Rivergate made up a gear lever that was offset forward about 1-3/4" for me (see Illustration #12), which took care of half the problem shown in Illustration #14. Illustration #15 then shows the solution. I trimmed back the opening in the transmission tunnel – cutting back 1-3/4" by 2" wide. In illustration #15, the cut appears to be much larger than this, but what is seen in the lower foreground is the piece of carpet folded back away from the cut. This was a small cut to make on the car. I actually saved the little piece so it could be welded back in should anybody wish to take the car back to original configuration. Beyond this, everything connected with the engine/transmission swap was totally uneventful. The original Magnette driveshaft fits with no change in its length. The front U-joint yoke is reamed out slightly to accept a Datsun U-joint, which connects to a Datsun front yoke and transmission spline. The process is certainly as easy as installing the original parts. Since the 1800 engine requires a bigger diameter exhaust system anyway, it is of little concern that the old exhaust system will not clear the new transmission crossmember that Rivergate designed and built (while I waited in their shop!). It is flat on the bottom rather than arched, as the original is, to accommodate the original exhaust pipe. I ran into a small problem connecting Rivergate's clutch line to my Magnette master cylinder. The adaptor fitting they supplied did not quite catch the threads in my MC. In their defense, it appeared that I was dealing with some damaged threads and I bought another adaptor as a local auto parts store that had a longer threaded barrel. This worked fine. The clutch was then quite easy to bleed and it works very smoothly with modest pedal effort. Illustration #16 shows the adaptor, and #17 shows the connection to the master cylinder. Part Three will later describe some other changes I have made in this car. They include air conditioning, 1987 Mercedes Benz high-back front seats with head restraints, and three-point seatbelts. Also, in honor of the electrical demands of the AC system, I have installed a Delco alternator. This should not be interpreted as a rejection of Lucas electrics – which work fine – particularly considering their age. It was the 63 amps of power for around $40 that lured me. The A/C system has just been finished, and the car now runs and drives superbly. Much to my driving delight, it does seem to cruise quietly and effortlessly at 70-75 mph. I am very pleased with all the components I selected and would strongly recommend them. For those interested, I'm happy to share more details of my experience to anybody who inquires. Feel free to use the e-mail address at the end of this article. To lure you on to Part Three, I'll leave you with what I hope will be an enticing photograph as the work was still in progress. Look for Part Three in future months! First, we have to finish this car and drive it from Virginia to Oregon for the upcoming North American MGA Register GT 28. Unauthorized reproduction by any means, print or electronic, of all or any part is prohibited by law. Comments on "Magnette ZB Engine and Transmission Swap"
Steve Carol. Contact him at LAVERDA@aol.com. Allen, I Just Happened to Stumble on Your Article. My 1958 ZB, "Definitely" NEED'z, (a) A Fifth (5th) Gear, OR (b) ?Compatible? ?Overdrive Unit, OR (c) Rear-End Swap (d) ALL of the Aforementioned. OR Combination Thereof. 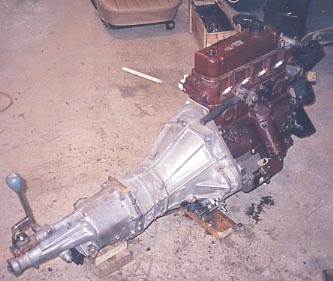 Here's MY Dilemma;My Current Engine: (Rebuilt) is, a 1959 A 1500cc, (Short Block). The Head/Valves, SU Carburettors,etc, Also ALL ReBuilt (Utilized Off of My ORIGINAL ZB Engine). There is Approximately, One Thousand (1,000) Miles on it, Since the Overhaul/ReBuild. NO Allen, I Don't Believe I Could Handle ($$$ OR Physically) the Route (I WISH) that You Took. ?If You Recall?? ?, We Live in Etna, California (96027) Population, Approximately Eight Hundred (800) Folk'Z. The Vast MAJORITY, Have Never Heard of, Let Alone SEEN a Magnette, Thus, Finding a "Capable Mechanic"..... WELL, I WON'T Go into My Nightmare'Z re : THAT. ?Watcha Say Amigo (Godfather of the Magnette'Z). ?Any Suggestions?? Michael. "Ya Neva Kno" Rating : *9 (No One/Thing iZ Perfect). To: Martin Peterson..... Sorry Martin, I Didn't See (No Pun Intended) Your Fix, On My Similar Situation.GraciaZ, Michael. "Ya Neva Kno". PS. Can't PiZZ Off the "Godfather".